Miami City Ballet’s inaugural opening was at the Gusman Center for the Performing Arts in October 1986. The sold-out audience delighted in two works of George Balanchine, ”Allegro Brillante” and the ”Tchaikovsky Pas de Deux”, as well as two world premieres, ”El Amor Brujo” and “Transtango”. Philanthropist Toby Ansin and NYC ballet superstar Edward Villella founded the company in 1985 at a former department store on an empty Lincoln Road. Since then Miami City Ballet has performed to acclaim at the Kennedy Center in Washington, D.C., New York, Paris and numerous other cities. 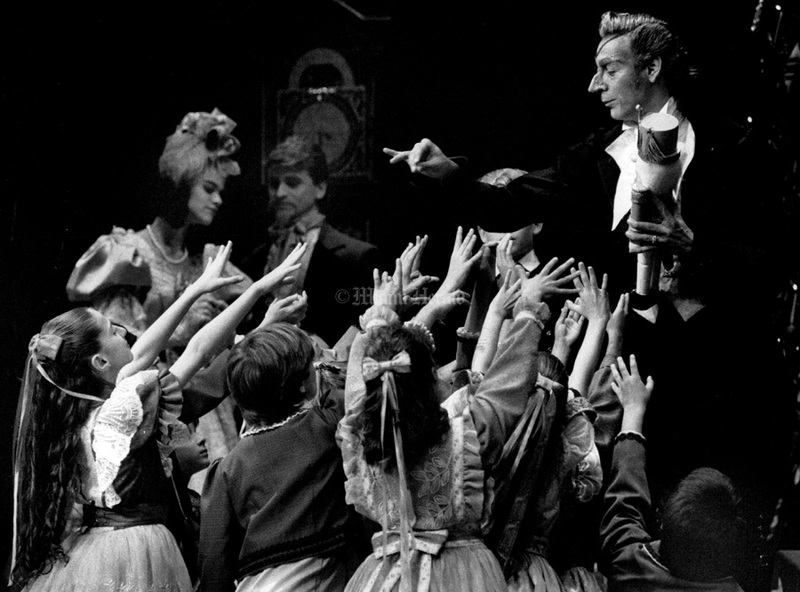 The troupe endured conflicts for much of its history, as Villella’s impassioned ambition led to clashes with board members and donors, leading to his ouster in 2012. 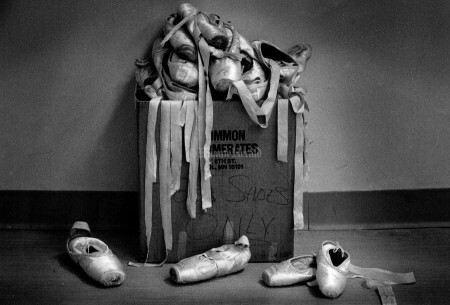 Today Miami City Ballet continues under Lourdes Lopez and continues to be a cornerstone of the city’s cultural landscape. 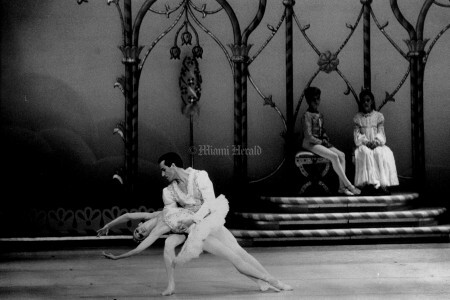 10/1/1986, Greg Lovett/Miami Herald: Jimmy Gamonet and Elizabeth Mackey of the Miami City Ballet. 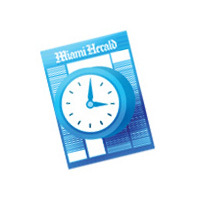 10/22/1989, Tamara Voninski/Miami Herald: The American society of travel Agents kicked off their convention with a performance by the Miami City Ballet. The New World Symphony also performed for the crowd at the Knight Center in downtown Miami. 9/13/1989, Tamara Voninski/Miami Herald: Miami City Ballet dancers surround the lead dancers Tim Melady and Sally Heagle during a rehearsal for the Japanese program Bugaku. This particular movement followed the part of the ballet signifying a consumation of the marriage. 10/4/1988, David Walters/Miami Herald: Ballet slippers thrown into a plain cardboard box sit at the side of the studio. 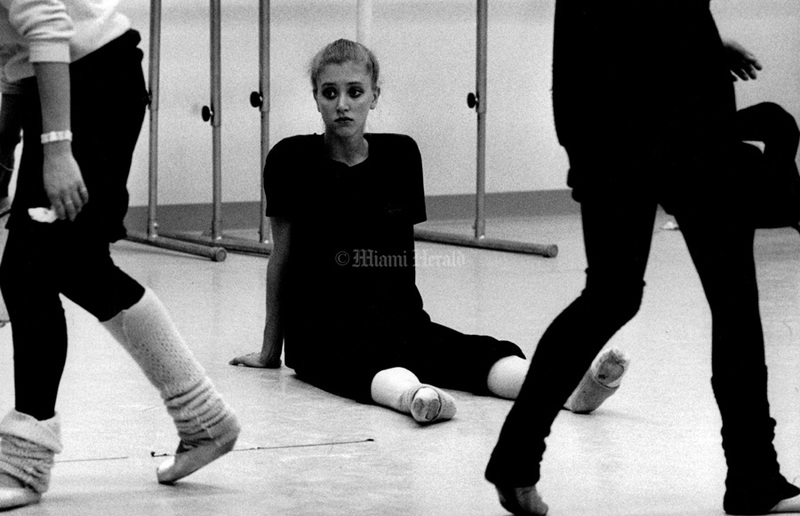 9/19/95, Patrick Farrell/Miami Herald Eliane Munier , a dancer with the Miami City Ballet, rehearses at the Ballet's studios on Lincoln Road. 9/15/1990, David Graff/Miami Herald: Rehearsal assistant Gisela Genschow and Ballet Steven Caras rate children auditioning for the Miami City Ballet's inaugural production of The Nutcracker. Parents of the children were not allowed into the audition hall so they had to get the best view that they could while looking through the window in the back of the practice room. 12/3/1991, Michelle Patterson/Miami Herald: Herve Casimir, 10, looks up to the famous dancers handing on the walls in the dance studio where warm -up is done. Undated, Susan Cook/Miami Herald: Miami City Ballet, "Steadfast Tin Soldier" Elizabeth Dretzin andTyler Ingram. 12/31/1986, Erica Berger/Miami Herald: Jimmy Gamonet De Los Heros rehearses with Sally Heagle for Bach in 3 movements. 3/18/1986, Pete Cross/Miami Herald: Kristin Brodowski. 8/19/1987, Erica Berger/Miami Herald: New Miami City Ballet members from Venezuela Franklin Gamero and Iliana Lopez. 10/8/1998, Peter Andrew Bosch/Miami Herald: Paulo Manso de Sousa taking in a little sun during a break at the Miami City ballet Studios at Lincoln road and Jefferson avenue as tourist look on. 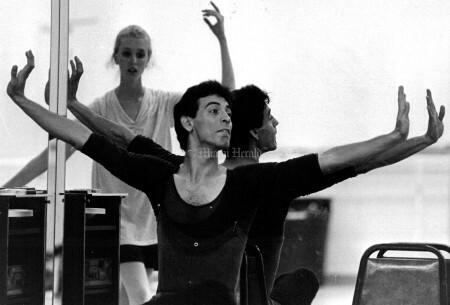 9/13/1989, Tamara Voninski/Miami Herald: Artistic director Edward Villella and Miami city ballet principals Tim Melady and Sally Heagle rehearse for the program Bugaku. 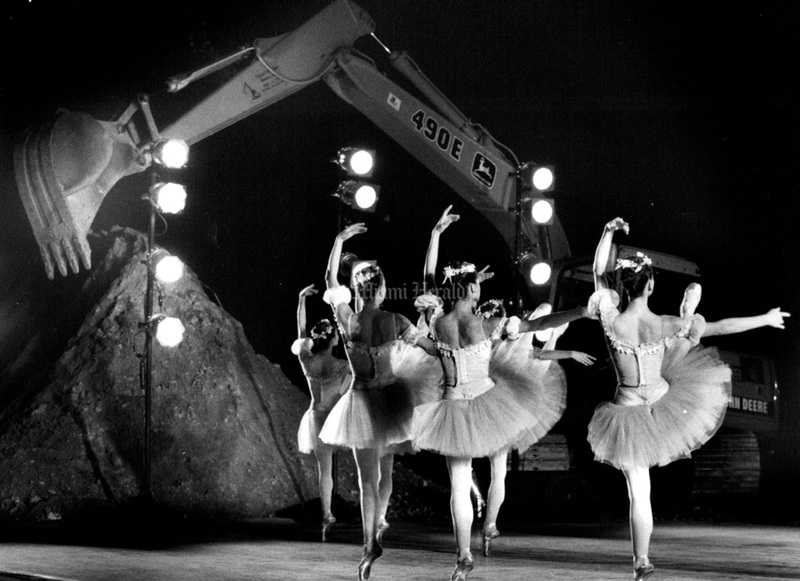 2/15/1994, Jeffery A. Salter/Miami Herald: On Williams Island, Fla. Bulldozers met Ballerinas at a groundbreaking ceremony for the fifth residential tower to rise at the 80 arce resort community on the intracostal Waterway. 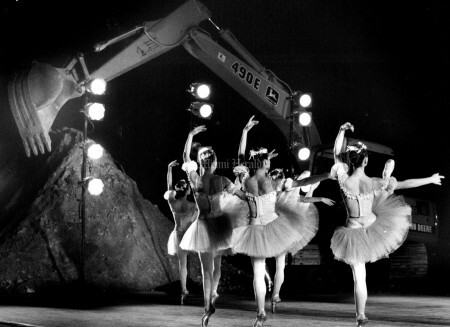 Miami City Ballet, performing one of Balanchine's best loved ballets on a raw earth stage flanked by an assortment of heavy construction equipment. 12/8/1990, Peter Andrew Bosch/Miami Herald: Jimmy Gamonet De Los Heros who is Herr Drosselmeir in the play The Nutcracker handing out gift's to the children. He is handing out the nutcracker. 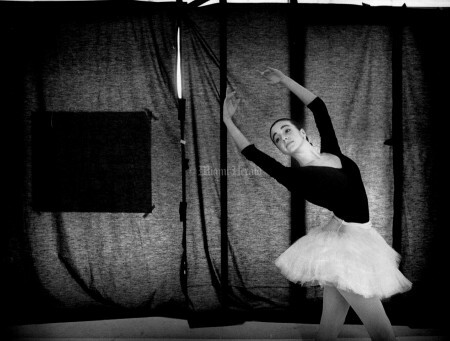 6/7/1990, David Walter/Miami Herald: Ballerina Denise Pinera goes through rehearsal with black material taped to the normally open windows of the Miami City Ballet's rehearsal studio on Miami Beach. 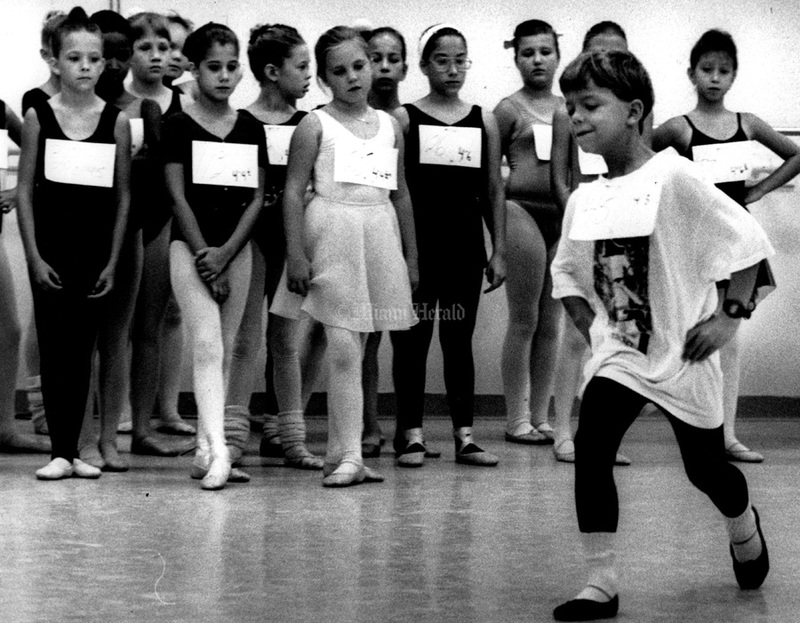 9/28/1991, Marice Cohn-Band/Miami Herald: Miami City Ballet audition for the children's roles in the nutcracker. Alex Lane 8 years old skips his turn as others wait. 9/15/1988, Donna E. Natale/Miami Herald: A day in life of ballerina Dominique Angel. She watches a tape of one of her previous performances before going into rehearsal. 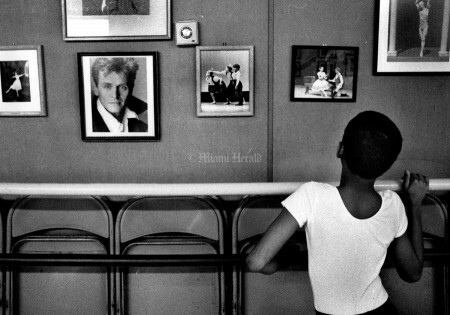 9/15/1988, Donna E. Natale/Miami Herald: A day in life of ballerina Dominique Angel after along day of classes and rehearsal Dominique rests in the dancers lounge with husband David Palmer. 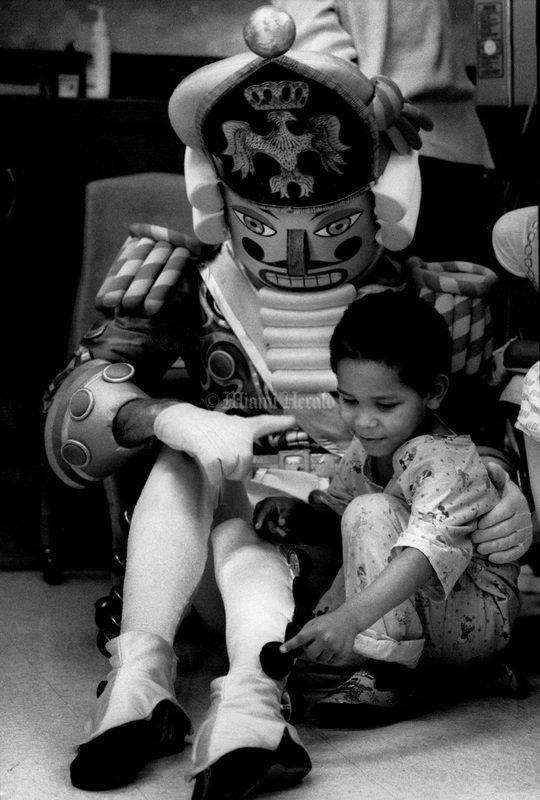 12/5/1990, Marice Cohn-Band/Miami Herald: Fabian Jackson 5 years old gets a close up look at the 8'tall Nutcracker Prince during a visit to Jackson Memorial Hospital East Tower, School Age Unit. where the Nutcracker met and gave gifts to the kids in The hospital. The Nutcracker Prince of Miami City Ballet's Nutcracker Prince" Ballet fully-costumed & 8 feet tall gave kids story books and coloring books about the ballet. 3/7/1987, Randy Bazemore/Miami Herald: Dame Sally Heagle takes a quick break amidst other dancers. 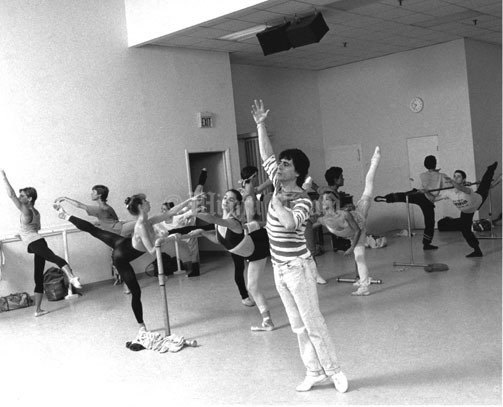 Undated: Edward Villella teaching a class. 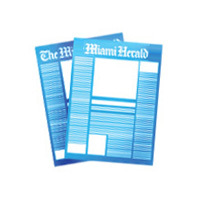 11/8/1993, Luis Castaneda/MiamiHerald: The Four Temperaments. 12/3/1987, Michel DuCille/Miami Herald: Toby Ansin cheers on Guy Paulo Manso de Sousa and Marcia Sussman during rehearsal as Edward Vallella looks.